What’s Your Strategy for Controversy? 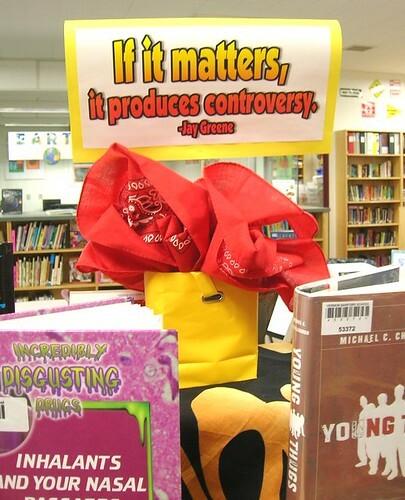 From a junior high library display: "If it matters, it produces controversy." I hope you’ll read the whole thing and let me know what you think of my analysis. What’s your strategy for navigating political and religious differences in the academy? There’s a strong case to be made for silence, especially until one achieves tenure. Let’s say it takes you seven years to finish your PhD, another seven years to obtain tenure – that’s a long time to remain silent, though, and neither of those milestones are guaranteed, by any means. Further, communicating your strongly-held-and-controversial views in a way that attracts others, rather than repelling them, is an ability that takes practice. If you wait until you achieve tenure — assuming that day ever comes — you won’t instantly become a persuasive public intellectual. So, how do you handle this sticky issue? Are there books, role models, or practices that you’ve found especially helpful? Who do you think does this particularly well? I look forward to reading the article. I like the quote in the picture, but do you think the reverse statement is true: “If it produces controversy, then it matters”? Thanks, Brian. I like the quote, too, though I’m not even sure the quote itself is true. The reverse is certainly assumed to be true in much discourse, no? Thinking of the church for a moment, controversies get a lot of attention, and it’s easy to think, “If we’re arguing about this, it must be important.” I attend a non-liturgical church, but one of the great strengths of the traditional liturgy is that matters of great importance are “hard-wired” into the weekly service. I guess being in a discipline that is all about creating controversy (anthropology), my strategy for controversy is to be respectful and professional while creating it, and to expect attacks from all sides. In my field there are lots of controversial and prominent models of Christian scholars–people who even decades after their death still spark controversy, e.g., Margaret Mead (someone so controversial that many Christians do not even know she was a Christian). If the great scandals in anthropology in recent years are any indication, the greatest controversy emerges not when anthropologists take a stand on particular social issues, but when we speak uncomfortable truths–such as when Dr. Thomas Headland (of SIL) revealed during the “El Dorado” controversy about an epidemic in lowland Amazonia that measles was accidentally introduced by missionaries and that the anthropologists who were implicated were not at fault for the epidemic, and were simply overwhelmed and unprepared for it. A little late to the discussion, but a probably obvious point is: do excellent work. Some fields like science are particularly fraught with the mentality that Christianity is only believable by the uneducated and unintelligent. Having an excellent performance and work ethic is often key to open doors for conversation on those “controversial” subjects. A great example is Rear Adm. Tim Ziemer – Coordinator of the U.S. President’s Malaria Initiative. Appointed by Bush Jr, he was retained by Obama primarily because everyone in the field petitioned to keep him on due to the excellence of his work.